May 17th are both 'International Day Against Homophobia and Transphobia' and Indonesia's 'National Book Day'. Let me combine the two and make the duo to be: Celebration of openness, freedom of communication, and acceptance towards diversity. Books can be the bridge to other realms, worlds and minds. I believe books are also the key to openness in order to gain freedom, power, and understanding. Yet, since last year, we know how many books are at stake to land on bookstores... to your shelf due to 'sensitivity' issue. How sad that books are made as first-place victims in politics. My simple wish on this special day... is that there will be no books that share knowledge, openness and truth to be banned, for whatever reason---religion or state. 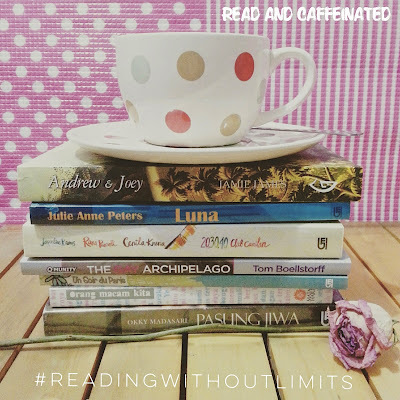 Reading without limits! No one should encounter any barriers to read a book. And let the world be a better and safe place for open-minded society.